I think we all suspected that Thomson Reuters had “something big” in the works … after all, it has been eight years since their last major launch: WestlawNext. Yesterday Thomson Reuters executives gathered in New York for a press event to announce the launch of a new AI enabled platform Westlaw Edge, a new search engine Westlaw Search Plus, litigation analytics and an exciting new Keycite features. Over the past decade there has been no shortage of either legal tech start-ups or AI hyperbole to fill the void while TR maintained a stony silence regarding AI and analytics. Well they did not disappoint. Thomson Reuters brought executive “star power” to the event to provide insights into the market context, the technology and of course the drivers. Presenters included Andy Martens, global head of Product and Editorial ;Mike Dahn, senior vice president, Westlaw Product Management; Jeff Arvidson, director, Product Development and Khalid Al-Kofahi, vice president, Research. 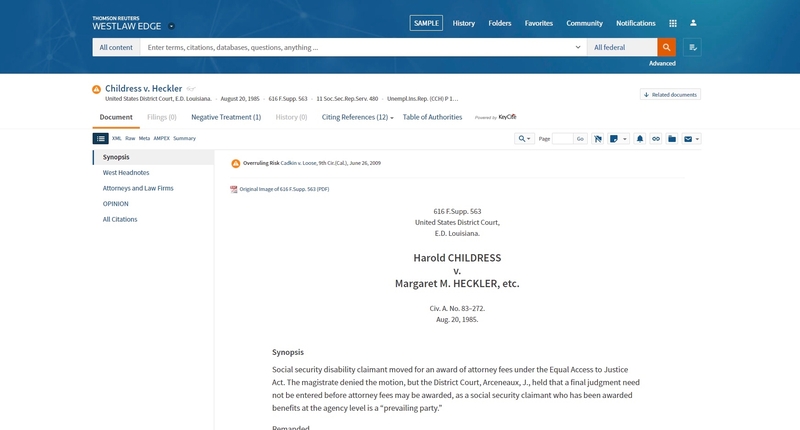 Westlaw Edge is a new version of Westlaw which Dahn described as enabling lawyers to move through routine work much faster and helping even experienced practitioners avoid mistakes on complex matters while offering attorneys new insights they’ve never had access to before. This product represents the fruits of Thomson Reuters largest investment in AI since 2010. It was developed by attorneys and technologists at the Thomson Reuters Center for Artificial Intelligence and Cognitive Computing in Toronto. The new platform and features leverage the deep taxonomies, and editorial enhancements developed by Thomson Reuters as well as the Outline of American Law which was developed by the predecessor West Publishing Company over 100 years ago. At a press event today, Martens reviewed the new functionality in the context of the volatile legal market place Dahn repeatedly assured the audience that TR was not launching a “robot lawyer.” He described the launch a new desktop enabled with AI and analytics which would streamline a lawyers’ workflow and drive efficiency. Arvidson explained the analytics and Kofahi provided insights into the AI and machine learning technologies behind the new solutions. Here are the key features which Thomson Reuters will be showcasing this coming week at the American Association of Law Libraries Conference in Baltimore. Key cite overruling risk West is introducing a new orange citation warning symbol. Up graded Keycite will offer a new, first of it’s kind “risk analysis” feature for case law which is no longer good but not explicitly overruled. Traditional citators are limited to warning lawyers about negative case law history where there are explicit citing relationships. In other words lawyers can inadvertently repeat the mistake of other lawyers lawyers and judges in citing to bad precedent. Machine learning was employed to analyze millions of cases to identify these “ bad law” cases which are invisible because they have no direct negative history. Westlaw Search Plus. This is a more sophisticated search engine which surpasses Westlaw Next. It uses AI to help lawyers surface answers to questions faster. Machine learning, natural language processing, citation networks, the Thomson Reuters taxonomy of law, the key number system and the West archive of twenty-seven million headnotes work together to optimize search results. It expands the “Westlaw Answers” feature to provide near instantaneous answers to thousands of new questions. By contrast, Westlaw Answers in Westlaw Next only provides answers for a limited number of issues: Judicially defined terms, Statues of limitation and legal elements. There is a type ahead feature which will allow lawyers to automatically populate a question which has been previously asked and answered. But lawyers can ask completely new questions as well. Integrated litigation analytics. Includes data for almost 8,000,000 federal cases going back as far as 1990 but with full federal coverage starting in the year 2000. State court analytics is more limited but coverage can be determined using a US map on the Westlaw Edge platform. Like it’s competitors West is offering analytics insights into judges, law firms, motions, districts as well as expert challenge analytics which can be used for pitch strategy, litiigaton strategy and venue selection. Motion types will provide data on 13 Main motion types and those motion types are further subcategorized. For example, motion analytics distinguish motions granted with and without prejudice can be distinguished. Arvidson estimated that there are 30 or 40 motion types in total. These motion types are available for all federal courts and selected state court such as New York and Cook County Illinois.Data can be displayed in the chart or a table. Data can be examined by role and analyzed or compared by plaintiff or defendant. Judges data will provide insights into both appeals of this judge’s decisions and appeals to a specific judge. Westlaw Answers for analytics! One very unique feature is that a lawyer can use a free text Westlaw Answers type query with the analytics. So you can type in a question about a specific judges motion grant rate and the system will automatically retrieve the analytics.This is the tightest integration between analytics and case law which I have seen, because West search plus functionality is woven into the analytics product. State court analytics for the most part is limited to enabling a lawyer to determine what kind of cases have been before a judge and what kind of experience do law firms and attorneys have in various courts or before various judges. Whenever possible they have mapped the federal and OS codes nature of suit codes so that the same terminology will work on federal and state cases. One issue which Thomson Reuters has not yet resolved, is identifying analytics for cases on issues such as commercial law for which there is no nature of suit code. According to Dahn they will be actively addressing that issue. Lawyers will no longer have to start scrolling through a case to find the right text. The new search will look within documents to bring lawyer to the responsive text. They will no longer have to tab through every keyword in the document. Westlaw Search Plus will not retrieve case law that has a negative history on the issue you are searching. The West helpline will augment their reference attorney team with “insights attorneys “who have special expertise on the analytics product. Restore prior filters. Sometimes you just go to far. In Westlaw next when this happens and you want to go back… You can’t you have to start over. Now in the click of a button you can restore your prior search. There will be more information in the results list. For example you can read more of the synopsis of a case instead of just the keywords. Saved searches. Laywers can now save searches to be run later without having to save them as Westclips which run automatically. Documents will have a table of contents so a researcher will always know where they are within the document. This will obviously prevent lawyers from Stumbling into a dissent when they think they are reading the main opinion. There will be a Westlaw Edge iPhone app. It will be rolled out to law professors on November 1st and to law students on January 1, 2019. It is somewhat ironic that although Westlaw was actually the first legal publisher to have a legal analytics product, they are the last to integrate analytics into their legal research platform. The original TR analytics product Monitor Suite launched about 14 years ago, at a time which it was inconceivable that legal analytics would emerge as a core legal research competency for lawyers. The Monitor Suite was designed for research specialists such as Librarians and Business intelligence staff. The new integrated analytics platform was not built on Monitor Suite– it is a completely new product built from the ground up. They recoded that data and added machine learning. So…did Thomson Reuters wait to long to launch an analytics product for lawyers? Can they catch up to Lexis which got a head start with the with purchase of two of the leading analytics platforms Ravel and Lex Machina. Bloomberg Law a relative newcomer to the legal research market launched their Litigation Analytics in October 2016. Even Fastcase acquired the analytics product Docket Alarm while we were all waiting to see when TR would launch an analytics product for lawyers. Lex Machina still has the most sophisticated dashboard in the market, but they do not offer data for all federal courts on all issues. They have been rolling out new modules at a quickening pace. Westlaw has a simpler dashboard than Lex Machina but this may work to their advantage.—it may be less intimidating to lawyers who suffer from numerophobia. Nonetheless they offer a robust variety of filters, features and displays which may allow lawyers to “ease in” to interacting with data. The natural language “ Westlaw answers” query feature even dispenses with a lawyer having to select courts or filters. There is a lot to digest in the new Westlaw Edge product and I can’t possibly do it justice in a single post. I think TR took a big gamble waiting this long to enter the analytics market and to turbo-charge their search engine with a suite of AI tools… but I am certain that all of these new features will cause firms to take a long hard look at Westlaw Edge. There are some exciting new features such as the “natural language query for analytics “ which are way ahead of the competition – at least for today. The one thing that is certain is that customers do benefit when vendors are competing this hard as they do in this to leapfrog over each other to offer the next “game changing solution.” Congratulations to Thomson Reuters leadership and the 200 plus programmers, scientists and attorneys on the launch of Westlaw Edge. Westlaw Next will continue to be available for subscribers who choose not to upgrade. Westlaw Edge is a complete replacement for Westlaw Next so accounts that upgrade will simply move to Westlaw Edge and will not find themselves navigating between to platforms in order to get all the content they need. According to the press release several ALM 100 firms have already signed on: Orrick Herrington & Sutcliffe, Shearman & Sterling and Lock Lord.